The latest issue stuff from Russia, where the money saved on cutting down the cost of the regular soldiers' kit is invested in kitting the specialists out with the best stuff possible. 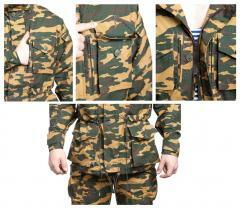 A damn fine modern camouflage suit! 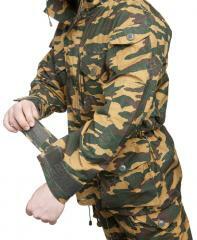 Availability: as with most Russian kit, these aren't readily available en-masse. We will probably never get any smaller sizes in stock, unfortunately no "Mickey Mouse" sizes here. There aren't many fatties climbing the steep mountain sides who need these, so this is what gets left over. Therefore we can't give any info on other sizes - we take what we can and that's it. The weatherproof canvas, roomy cut etc. are all familiar from the older Gorka mountain suits. Here we have all these fine properties topped off with excellent large pockets, ripstop reinforcement and zippers. You could call this a Gorka x 2! All wear-prone areas are reinforced and every place that needs adjustment has the option added either by way of velcro or elastic drawcords. The pockets have extra long sides that fold over the opening to perfectly seal off the contents from the elements. 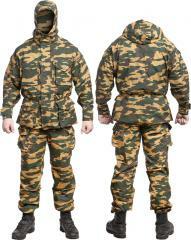 This is not some half brained mix of a parade- and field uniform, but a first class combat suit for harsh environments! Two-way zip-up front, covered with a buttoned storm flap. Four large bellowed buttoned pockets, two on the chest and two on the hem. Two vertical zippered chest pockets, two buttoned sleeve pockets and two velcro breast pockets. Elastic drawcords around the waist and hem. 6 cm belt loops, positioned a bit below the waist line which keeps the trousers from bunching up beneath the belt. Two slit side pockets and two buttoned back pockets. Two large bellowed and buttoned cargo pockets. Snow block cuffs with inner and outer layers. Elastics on the waist and cuff ends. Made from ripstop reinforced cotton with a water repellent treatment. Wash in 30 degrees. The first two-digit number gives the width in the standard European size system while the single digit indicates the length according to the Russian system. We have converted the length into centimetres to make things clearer. The cut is quite roomy, as these are meant to fit over thick warm underwear. For some reason, even the size 54 doesn't look all that bad on a size 48-50 person. Maybe it's the adjustments, maybe Putin has blessed these, or (and we consider this by far the most likely scenario) in modern Russia, the uniform wears you. Unissued stuff, so unissued in fact that you can still see some chalk marks from the factory. For being manufactured in Russia, the jacket and trousers are actually very nicely put together (though I would have preferred YKK zippers). Plenty of pockets with nice buttons as well as a good number of cinch cords to help fit the jacket to your liking. The only Velcro you'll find is on the cuffs and the inner jacket pocket. The fit was also good, baggy but not too much; you should be able to fit another layer underneath no problem. An overall nice set to add to the collection and for a reasonable price considering these aren't all too common (Russians always screw you over on the shipping charges).